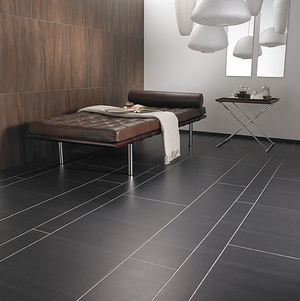 Vinyl flooring with a rigid pvc base which stands out for its water resistance, reduced thickness and easy installation. Its surface simulates woven textile. SimpLay is a collection of loose lay tiles replicating the natural beauty of wood, designed to reduce installation time and provide easy access to under floor utilities. Fascinating stone effects Featuring some of the most beautiful natural stone and slate designs in the world. As authentic as they are exceptional. PVC tile is a rigid, synthetic surfacing material made from polyvinyl chloride, usually in 45-centimeter-square or rectangular units. It is non-porous, abrasion-resistant, comes in a variety of colors and finishes, and is easy to install and maintain. These tiles can be used to cover suspended ceilings and interior floors in moderate-traffic areas, including kitchens and bathrooms, where moisture is a factor. Varying composition and manufacturing techniques can confer additional properties, such as acoustic insulation and non-slip surface. Tiles also can be made to resemble wood, marble, metal, stone and other materials. Choice will depend on the technical and aesthetic requirements of the location.